AES utilizes a cross-functional project team from design through commissioning. This multi-discipline approach is dedicated to delivering a compliant facility. AES has strict quality, cost, and schedule expectations. The AES team is comprised of experienced personnel who have a full understanding of how to construct in a GMP environment and how to seamlessly transition a facility toward operational readiness. This integrated team implements a continuous process that starts with initial scope review to confirm client expectations, progresses through carefully orchestrated cleanroom construction, hands off a fully commissioned facility, and concludes with a Lessons-Learned exercise to ensure we are always improving. The repeatable execution of this process is what differentiates AES in the biotech and pharmaceutical cleanroom marketplace, and our clients benefit through the maximized speed and minimized risk that we deliver. AES executes the design details that were developed during the engineering and pre-construction phase to deliver the high-quality results of modular cleanroom construction. AES utilizes an effective blend of in-house skilled labor technicians and factory trained regional labor forces (both union and non-union crews are available) to build our cleanroom facilities. 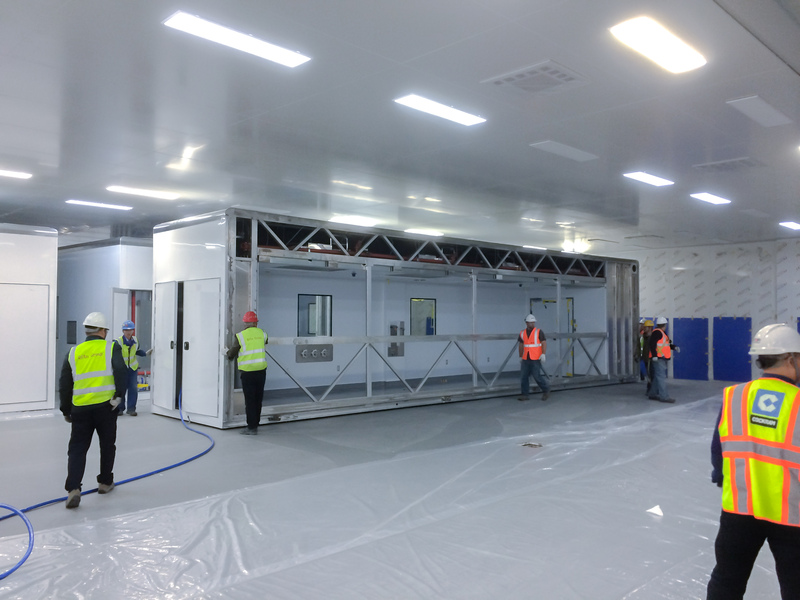 AES coordinates with the other project disciplines to integrate the modular cleanroom scope of work into the overall facility. AES manages the activities of its team to maintain project schedule, quality, and safety. With AES pre-engineered modular construction, our clients are leveraging our clean construction techniques to ensure that the project site starts clean and stays clean throughout the construction of the facility. Late arriving process equipment can easily be accommodated without concerns for contamination of those critical investments as construction is completed around them. Portions of the modular facility can be left out to accommodate the rigging pathway for process equipment, and then we plug together the remaining portions of walls and ceilings under clean construction.